Grand Junction – The Colorado Mesa University Foundation is hosting its annual Day of Giving on April 10 celebrating the generosity of the community on a day that also marks the 94th birthday of Colorado Mesa University. Students gathered in the University Center at noon to celebrate the event's mid-way point. By 1pm, CMU had beaten the previous year's total dollars raised figure. Despite breaking the previous record event participants gathered to remind the community there is still time to make an investment in CMU. During the mid-way rally, fundraising campaign chairs joined campus officials to encourage charitable giving for a variety of campus causes and initiatives. CMU President Tim Foster issued a challenge to CMU supporters during the event's mid-way rally as did CMU Alumni Association Board members. "The size of your gift doesn't matter," said Foster. 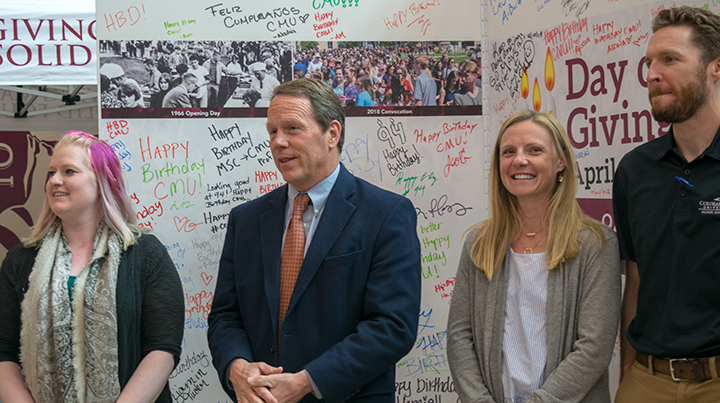 "What does matter is that your contribution is really a recognition that students, faculty, clubs and initiatives at CMU that are making meaningful contributions to education and accomplishing amazing goals that enrich the community." This 2019 Day of Giving features 18 campaigns and causes that offer donors a wide variety of philanthropic opportunities. "This year's investment opportunities during Day of Giving include science, social issues, performing arts, athletics and a host of other categories that range from local interests to global causes," said CMU Foundation CEO Liz Meyer. "There is literally a cause for everyone and no gift is too large or too small to be meaningful." One of the highlights of Day of Giving is the promise of a $5,000 bonus to the project with the most donors at the end of the 24-hour event. Additionally, CMU supporter Louis Buescher provided a $250 match to the campaign that had the most donors by noon. "If everyone in the community donated $5 to their favorite cause, think what an amazing opportunity that would provide for students," said CMU Foundation Board President Clara Brown-Shaffer. "This is one of my favorite CMU events of the year because it shows the value of grassroots efforts and reveals the value of CMU though these incredible causes and campaigns." To reinforce that the day is only half over, members of CMU's leadership team joined the cause. 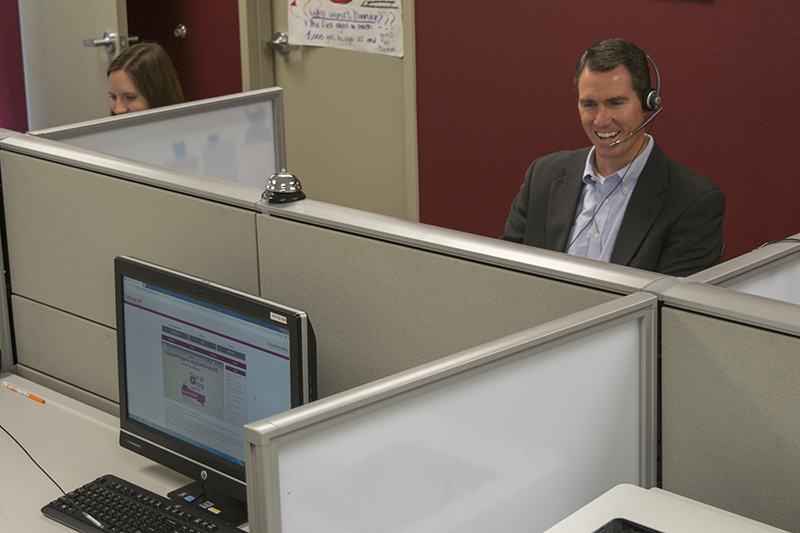 Vice President of Student Services John Marshall joined the Maverick Call Center during his lunch hour to work the phones with students, alumni and supporters. "Day of Giving is one of those events where the org chart disappears and everyone stacks hands at CMU to make a difference," said Marshall. "I'm never one to let lunch stand in the way of a great cause." CMU Foundation COO and Day of Giving event coordinator Tina Kleespies reminded the community that they still have time to make their donation and that CMU volunteers are available to answer questions and take their calls and contributions. To learn more about each of the 18 campaign and to make a donation, CMU investors should visit supportingcmu.com/celebrate94. Media are encouraged to visit the foundation and student call center.